As for most new digital cameras in Panasonic’s Lumix family like Lumix GH2, recording movie is no longer an additional function but a key feature for saving memories. If you have such a potable digital camera, it is usual to have hundreds of or even more footage clips stored in the camera once you finished a holiday/business journey. What are you going to do with these footage clips? Will you edit them with a video editing program to make ordinary to extraordinary? If you are running Avid Media Composer on your Mac computer to do so, you may have some trouble, because Media Composer is unable to read AVCHD Lite files directly. You have to convert Panasonic AVCHD Lite to a compatible format for your editing software. The thing is that most people have not figured out a simple and available way to do so. Some people use a video converter tool to convert AVCHD Lite to TS firstly, and then use ProCoder3 to convert the generated TS to M2T for using in Avid. It’s workable, but complicated. Why not use a one-stop tool to finish conversion at one shot? Aunsoft Panasonic AVCHD Converter for Mac is what you are looking for. The AVCHD Lite Converter for Mac can convert AVCHD Lite 720p videos to Avid Media Composer supported file type in simple steps without help from third party software, which is really ease-to-use and straightforward. The following contents will demonstrate how to use it to process Lumix AVCHD Lite to Avid Conversion in detail. DNxHD is a proprietary Avid format, which is a video codec intended to be usable as both an intermediate format suitable for use while editing and as a presentation format. DNxHD offers a choice of three user-selectable bit rates: 220 Mbit/s with a bit depth of 10 or 8 bits, and 145 or 36 Mbit/s with a bit depth of 8 bits. DNxHD data is typically stored in an MXF container, although it can also be stored in a Quicktime container. Here Aunsoft Panasonic AVCHD Converter for Mac just packs it in a Quicktime (MOV) container for using with Avid Media Composer. A detailed instruction-how to Transcode Panasonic Lumix AVCHD Lite videos to DNxHD MOV for Avid Media Composer? 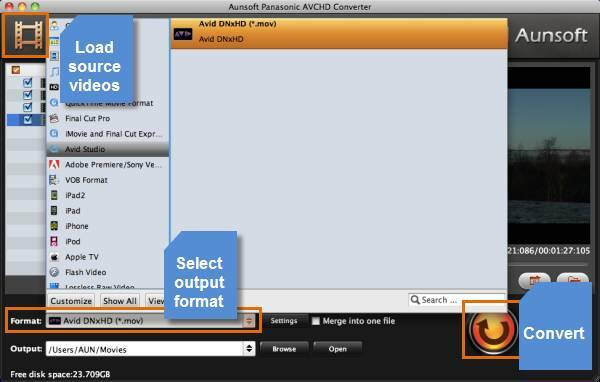 Step 1: Free download Aunsoft Mac Panasonic AVCHD Converter, install and launch it. After run the Lumix MTS Converter, click “Add Video” button to load your camera recordings. The software supports importing video clips in batch, so you need not waste time to add them one by one. To combine imported files into one file, you can simply tick off “Merge into one file” option. Click the format bar or the pull down menu of “Format” to select output format. The AVCHD Lite Converter for Mac features an optimized format preset for Avid Studio, to transcode Panasonic Lumix AVCHD Lite videos to Avid Media Composer, just choose Avid DNxHD (*.mov) as target format under “Avid Studio” tab. Click “Convert” button to start converting Panasonic AVCHD Lumix video to DNxHD MOV for editing with Avid Media Composer. When the conversion is finished by Aunsoft Panasonic AVCHD Converter for Mac, click “Open” button to get the converted DNxHD MOV files. And now you can bring the output MOV files into Avid Media Composer to create your own masterpieces. By the way, if you wanna manage or backup your MTS clips directly from your camera, or do frame by frame editing before inputting to Avid, you can give Final Mate for Mac a shot, which is a great companion for camcorder/camera users. The following 3 articles elaborate how the Final Mate for Mac software works. How to Present Wedding Video on Reception with LCD Projector?